The Microsoft SQL Server Best Practices Analyzer is a free tool, provided by Microsoft, which lets you test for the implementation of many common SQL Best Practices. The SQL Server Best Practices Analyzer Action allows you to verify those Best Practices from within FinalBuilder. Specify the SQL Server Best Practices Analyzer installation directory from the SQL Server tab in the Options. 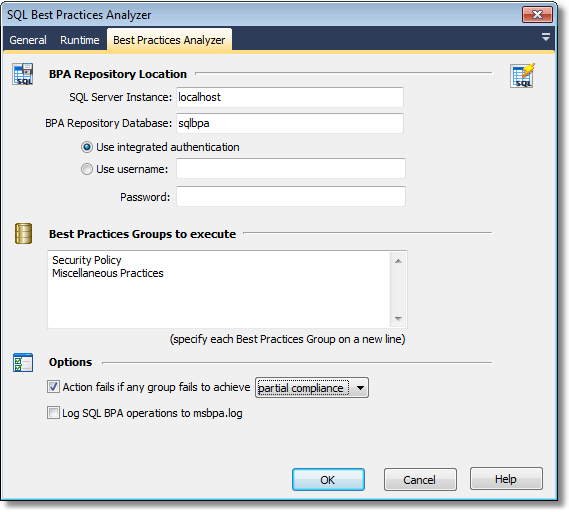 The BPA Repository is a database which contains your Best Practices Groups (created with the Microsoft SQL Best Practices Analyzer application.) Specify the SQL Server Instance, database name, and authentication options for the Repository database. Specify the Best Practices Groups you wish to check against. Again, these are defined inside the Microsoft SQL Best Practices Analyzer application. If you are specifying more than one Best Practices Group, specify each on a new line. Note that at present you cannot execute Best Practice Groups associated with SQL Servers which require SQL authentication (Windows authentication only.) This is a current limitation of the Microsoft command line tool. The action can be set to fail if any group fails to pass compliance or (optionally) partial compliance. If this option is checked, the analyzer will log its behaviour to msbpa.log inside the 'log' directory of the Best Practices Analyzer directory. Note that each Best Practices Group also generates a log file in this directory, regardless of whether or not this option is checked.